Open your pass project from the dashboard, then click the Settings gear icon and select Certificates. 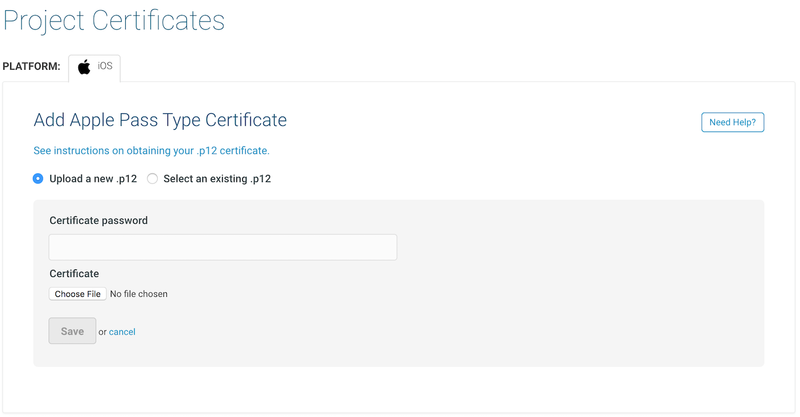 If you do not yet have them, complete the steps in the Airship Support article How to make an Apple Pass Type Certificate, then return to this screen to add them to your account. If you need to renew an Apple Pass Type Certificate, also follow the steps in the Support article but instead of creating a new Pass Type ID, select your existing Pass Type ID from the list. After making your selection, click the Edit button, then continue with the article steps, starting at step 6. Changing the Pass Type ID for the certificate used on your project will make it impossible to edit passes generated with the old certificate. For this reason, you should ensure you have uploaded a valid certificate before you begin making passes. Upload a new certificate to the project. Select the radio button for Upload a new .p12. Click the Choose File button, and select the .p12 (exported certificate) file. Click the Save button, or cancel to discard. Repeat these steps to add another certificate. Designate which previously uploaded certificate should be used with the project. Select the radio button for Select an existing .p12. Select a certificate from the dropdown menu. You may change the project's certificate as often as needed. If you have created any passes for a project and then change the certificate, you will be unable to interact with or update those passes. The certificate authorization will fail on those passes and they will be in an orphaned state. Use Replace certificate when you need to upload a new certificate to your project, typically to replace an expiring certificate. The new certificate is validated upon upload to verify it has the same basename and Team ID as the original. If it is not a valid replacement, you are given the option to add it as a new certificate. Click the Replace certificate button. Google Pay integration is initiated by Airship. Please contact us to make your request for setup.